Cognitive dissonance is a warning signal about conflicts in our automatic or willful journey of understanding reality. How we resolve that internal disharmony is another issue. when our perception of reality (internal subjective) is in disharmony, disunity or disequilibrium with the actual reality (external objective). The map does not reflect the territory accurately. when we have an accurate perception aligned with objective reality (the map reflects the territory) but the information provided is in contradiction to reality (such as info coming from someone else). when our behavior is in opposition to that of others (whether morally related or amoral). We will have emotional cues about the conflict, such as anxiety, guilt, shame, anger, embarrassment or stress. Maybe we won’t even recognize how there are conflicts, tension, friction or interference between the old and new. This is how cognitive dissonance is related to double-think. Double-think is holding two conflicting or contradictory ideas at the same time, without resolving them. The feelings from cognitive dissonance however, are there to signal an issue that needs to be resolved. Cognitive dissonance is good, not bad. It’s how we unconsciously or consciously process the warning about an error that matters. Social conformity and peer-pressure deal with a contrast of information between one’s own behavior and that of others, which will elicit the disharmonious emotional cues telling us something is up. The error is in how we or other people are choosing to behave sub-optimally or possibly bad ways. We then conform to the social behavior demonstrates in order to fit in and not feel like an outcast or reject of the social conventions that surround us. There is a video of people facing the wrong way in an elevator at the end of this post to demonstrate #3. Self or Other Has False Info that Doesn’t Reflect Reality? Is there a contradiction between the old info and new info? Is there a conflict between what we desire reality to be and what reality actual is? Or maybe it’s the information that another source is giving us that is false. Receiving false information will conflict with our previously assimilated accurate information, if that is the case. Either way, this conflict needs to be addressed. 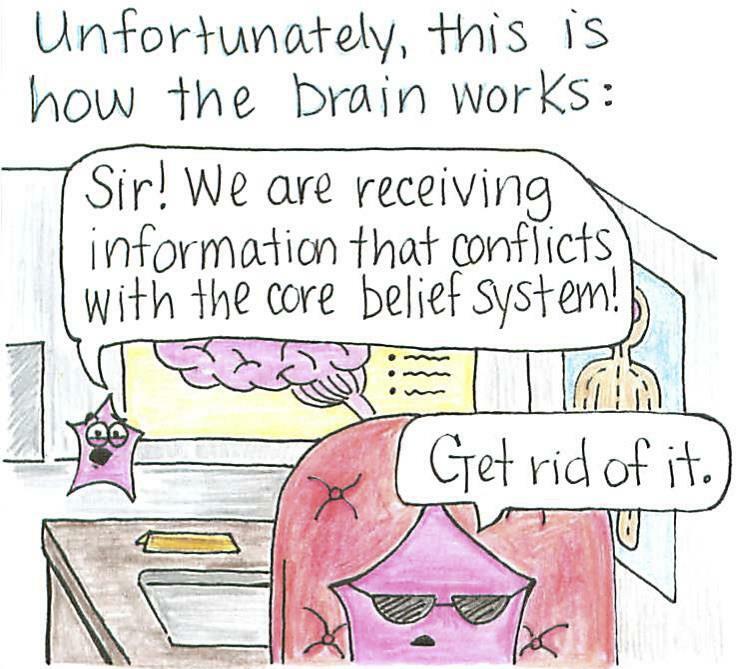 Cognitive dissonance can be resolved positively, or negatively. A positive resolution is when filtering the information is done to assess how to update our perception or internal map of reality to most accurately reflect the external territory. Critical thinking with logical consistency allows us to weed out the errors and rebuild our understanding of reality more accurately. We need to verify if something is reflected in reality, or if not then whether it has greater logical consistency than another unverifiable claim. This can occur unconsciously/subconsciously, but we can verify the intuitive assessment with conscious effort through critical thinking. We need to verify that either our previous/current accepted information, or the new information, most accurately reflects reality. We doubt and question with critical thinking to process the information. Discerning, evaluating, assessing, diagnosing, judging and filtering out contradictions to determine which is demonstrably reflected in reality and which is not. This can also be called conformity to truth/reality/existence. A negative resolution is when an inaccurate or false representation or refection of reality is kept as part of our perception or map of reality. This is when we willfully or unconsciously reject conflicting information because it does not conform to our expectations or what we believe. We can be attached to the old/current information because it is part of how we see the world (worldview) and ourselves (selfview), thus providing a foundational basis for our ego-personality-identity construct. This can also be called conformity to falsity/unreality/non-existence. I’ve also called the negative resolution a “reality negotiation” where we justify our own deception, illusion or delusion. Instead of verifying what is the reality, we opt for the self-deluded belief and create an unreality to live in. Instead of us changing our false perceptions to align with reality, we say “nah”, and believe what we want. That is a successful negotiation with reality, where reality does not stand as the master, ruler or measure of what is or isn’t real, but we instead have supplanted ourselves to be above reality so that we can decide when reality will be the determinant factor and when our self-deluded egos will be. It’s negotiation where we do all the talking and win, to our own detriment. Rejecting reality that forces us to change ourselves is hard and uncomfortable to do, let alone to accept. It’s psychologically painful to face the mirror and see the falsity we live by. So in our quest to “feel-good“, we reject the truth in reality in favor of our false perceptions which allow us to maintain our attachment to falsity and live in a unreality because it “feels-good”. 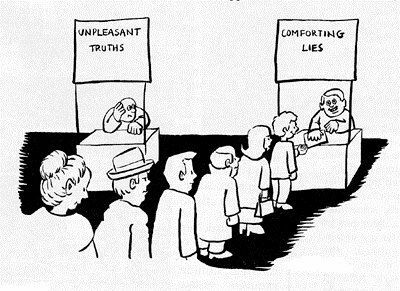 So we prefer the comforting lies or fanciful beliefs, rather than the hard truth or harsh reality. We lie to ourselves and create an illusion/delusion or false image of ourselves and reality. For some, being wrong is something they can’t face up to. Being wrong doesn’t “feel-good”, does it? That’s something else our pleasure trap attachment has us avoid, truth be damned. We can change how we think about a bad decision and see it as good, and even justify and convince others of the same. When we act in ways that diverge from how we perceive ourselves to be (self-image) or how we want to believe ourselves to be, then we change our thinking to justify the new behavior, or even change our own identity to conform to the new behavior so that there is no more conflict or dissonance. When we are deceived by falsity and believe it to be true, we often don’t want to let go because of how important that belief has been to our identity, self-view and worldview. So much of what we base ourselves upon comes from our conditioned past where we uncritically accepted the experiences and information from our environment, society, parents, media, etc. This all shaped us into who we are now. Learning that part of who we are now is based on a lie can be hard to accept. So denial, ignorance, rejection, deflection, projection, and even anger and violent behavior can result when someone gets information that shatters part of how they see the world or who they think they are. The solid ground is broken and we fall into the void, abyss and unknown of being without a foundation to rest upon. But no need to panic. That just means the foundation needs to be rebuilt with verified reality instead unverified beliefs that comes from the past. Essentially just telling people the truth that they don’t want to here will generate cognitive dissonance and likely the negative resolution process. But falsities can be said that people don’t want to hear either. Some people will keep saying false things even when reality demonstrates it to be so. Cognitive dissonance occurs in group-think, peer pressure or social conformity.